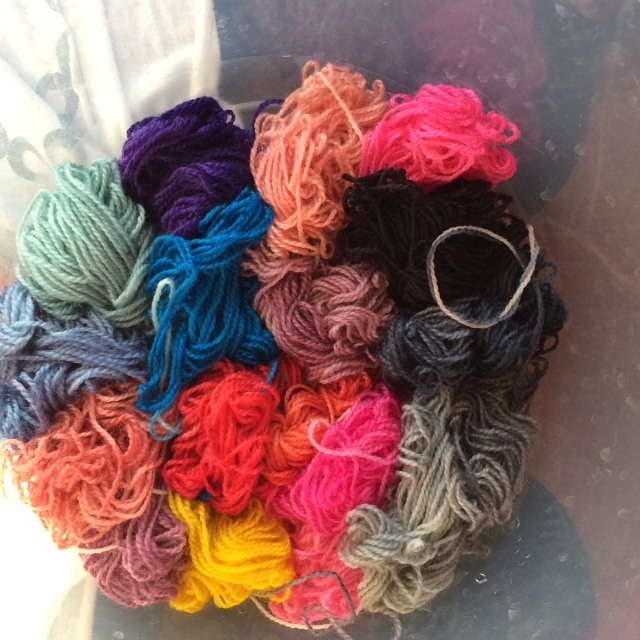 Hi there, if you have been reading my blog lately you will know that these days I’m doing lots of experiments with my dyeing and this weekend I did some gradient dyeing. 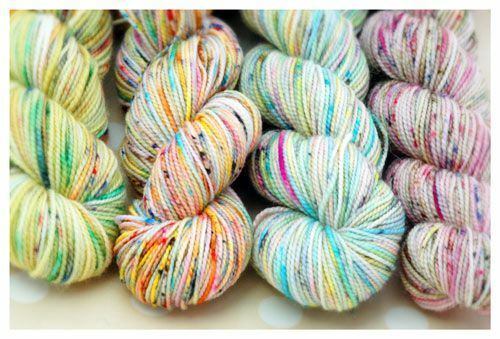 The difference between striping yarn and gradient yarns (my definition) is that a striping yarn has 2 or more colors and usually each color will run X meters and knit up into a few rows/rounds of colour that either repeat themselves or not if you are doing a sort of rainbow stripes. 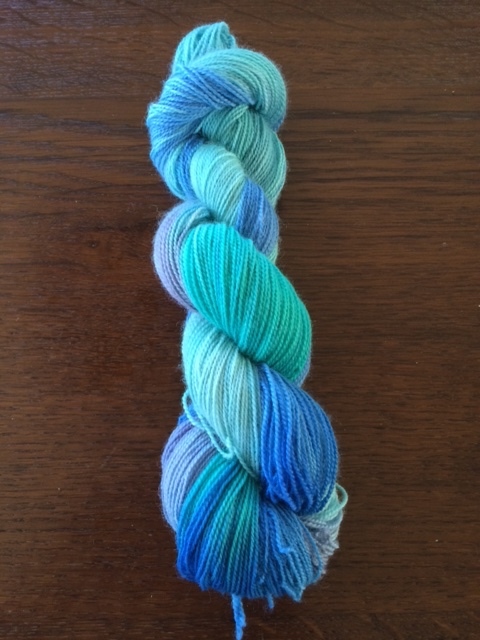 Gradient yarn/dyeing will have longer color sections that will then blend into each other. This can be done using colors that are similar and the transition from one color to the next is sort of natural, the color seems to change organically. Or you could do this using bright and contrasting colors where you will notice the end of one section and the beginning of the next, more than when using more muted or similar colors. 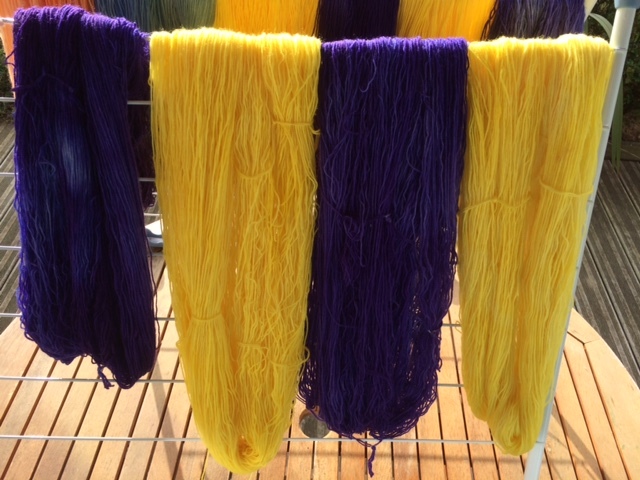 This also requires a new technique which is very different from dyeing striping yarn and is quite time consuming and I think that is why there is not a huge selection of hand dyed gradient yarn on the market and why that kind of yarn is higher priced. 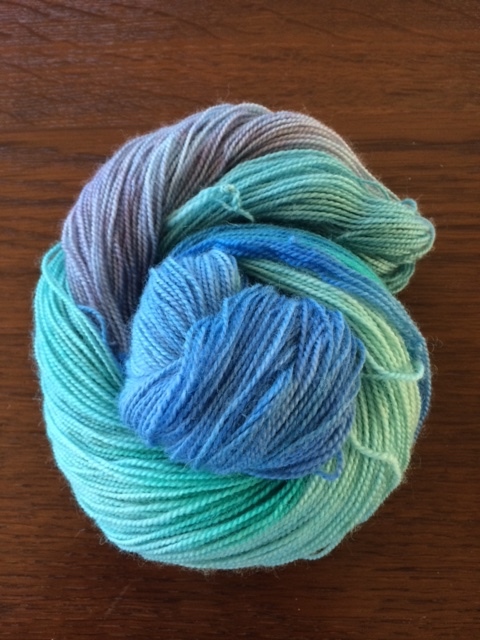 I’ve long wanted to give this a try and as I had a client contact me requesting a custom dye order for gradient yarns, I jumped right in and said YES! Of course I can and will do this for you! 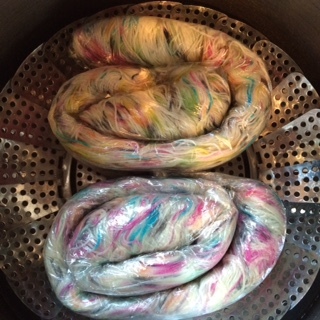 But before dyeing her chosen yarn base, I decided to do some test dyeing first. 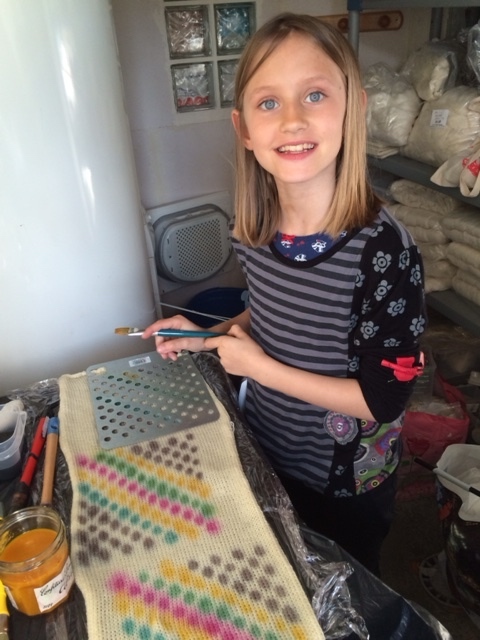 Both for me to work on my colors and combinations and also for her to see some examples and then choose her colorway. I did 2 sessions and I really like the outcome, especially for the second one. 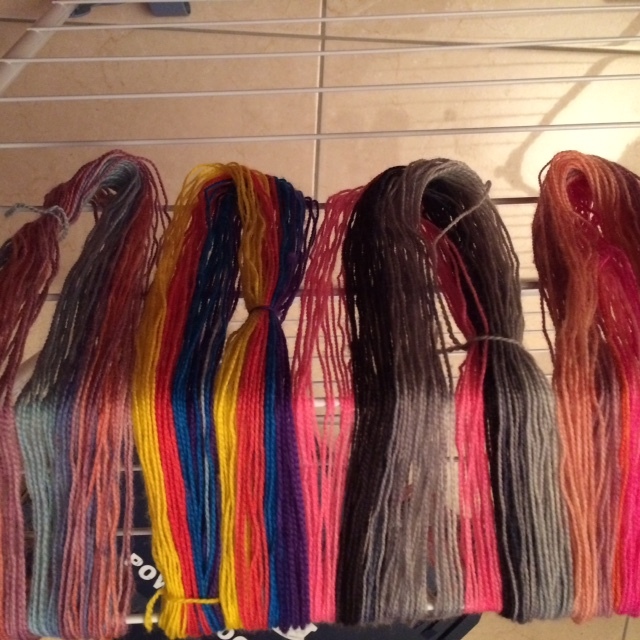 I made some mini skeins where each colour would run between 10-20 meters and used 4 or 5 colors per mini skein. 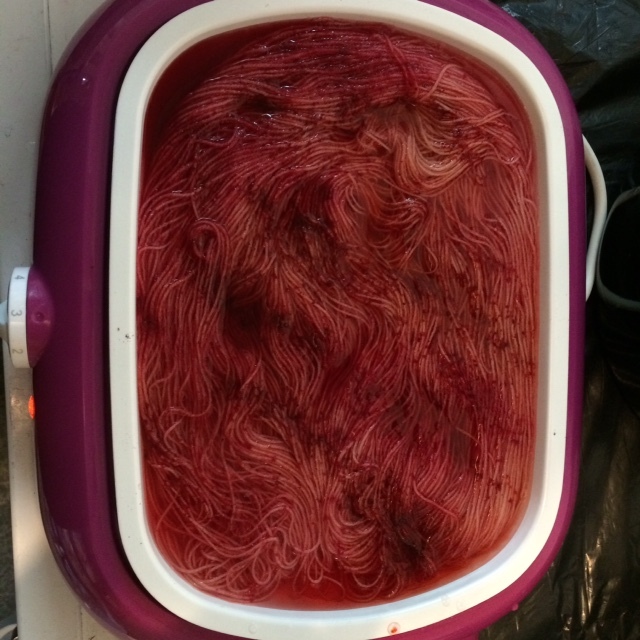 It is not possible to dye gradient yarn in one skein so after dyeing I had to rewind my yarn into a skein for it to dry and then once dry I wound it into small yarn cakes. Yarn cakes don’t look as good when they are super small as they do when regularly sized but you will get the picture of what it looks like. Here I played around with mostly blues and greens in different tones and depths as well as some yellow as you can see. 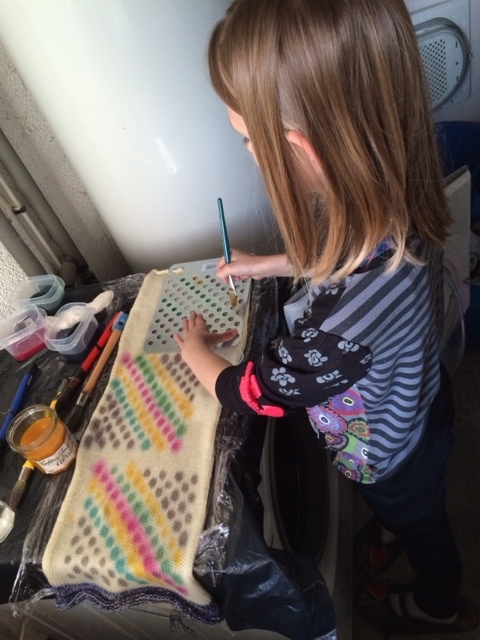 The cake at the top is the biggest I made and here I used 20 m per color where the rest is only 10 m per colour. My favorite is the big one at the top because I feel the colours really flow together and the second favorite is the middle one on the bottom, the blue one. The only “problem” with this one is that the blues are maybe too close in color to one another and so at times 2 different colors really flow as one so, I’ll have to rework that. 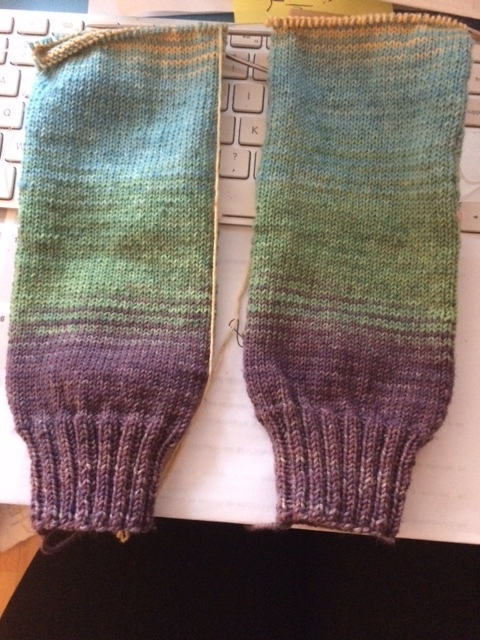 After this test I had some dye left and so I quickly dyed a full skein of sock yarn using up the leftover dye and I think it came out beautifully. 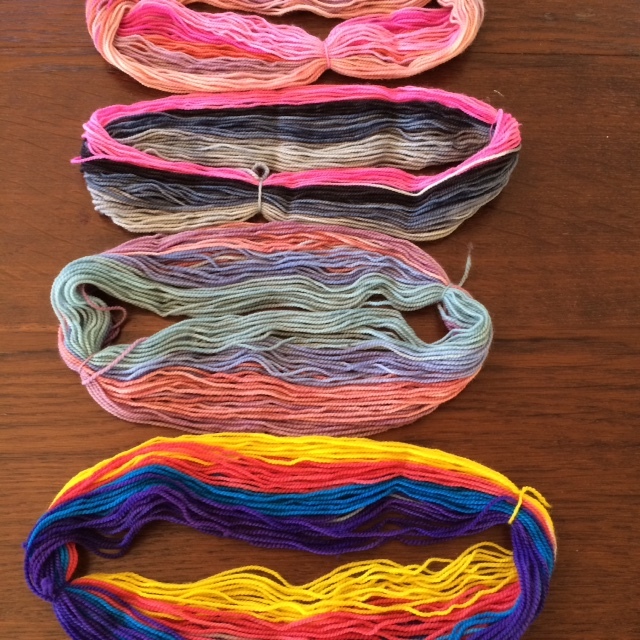 Here the mini skeins are dry and I tried to lay them out in such a way as to show all the colors in each. So I did 4 skeins, 2 with 4 colors and 2 with 5 colors. 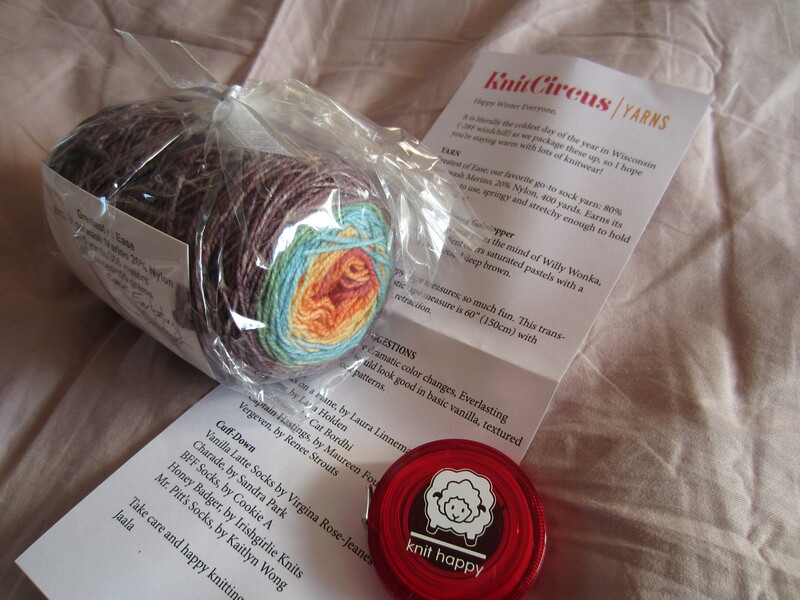 Here they are wound into mini yarn cakes. Now I just need my client to make up her mind and then i’ll be ready to dye her chosen yarn base! I’m really happy with the outcome and out of my 2 test session I can really see 5 colorways that I’d like to develop and repeat and I can see me doing those both for yarn and fibre for spinning. 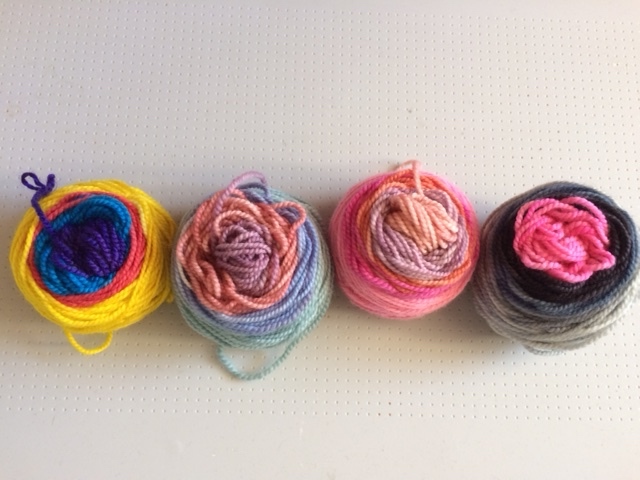 In this test my favorites are yarn cake nr 2 and 4 from the left. What do you think? 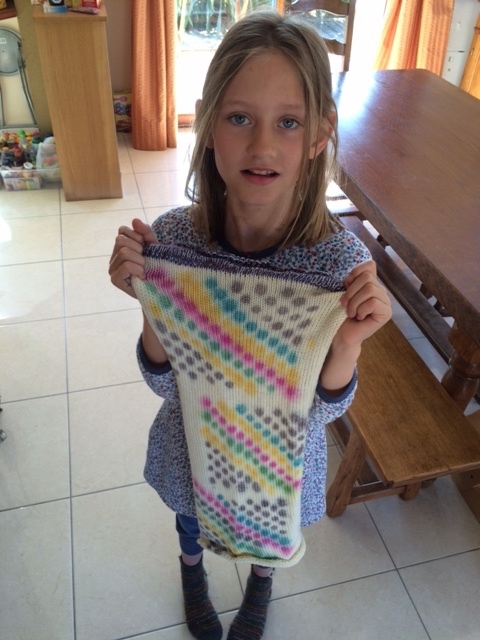 And today I embarked on a new test, not gradient but cotton! I’m not used to dyeing cotton. That requires a different kind of dyes and a different method. My supplier of undyed yarns just added some Pima Cotton to his offer and I decided to give that a try. 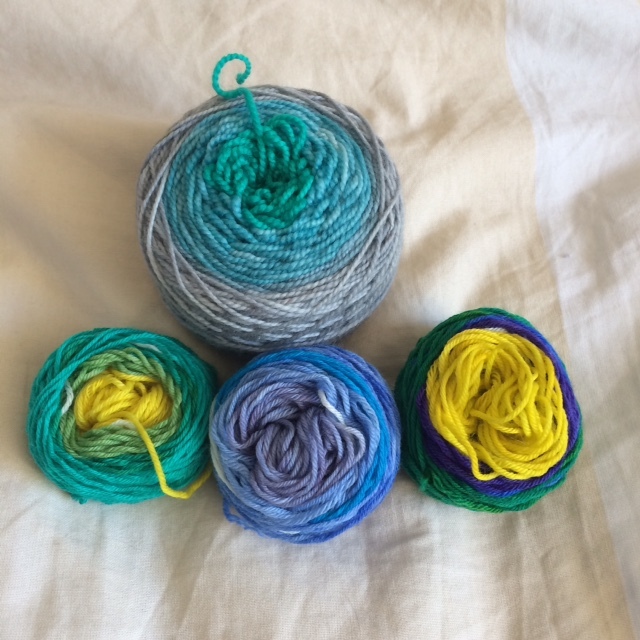 Pima cotton is high quality cotton and the yarn can look and feel wonderful and as summer is here, I decide to give that a go. 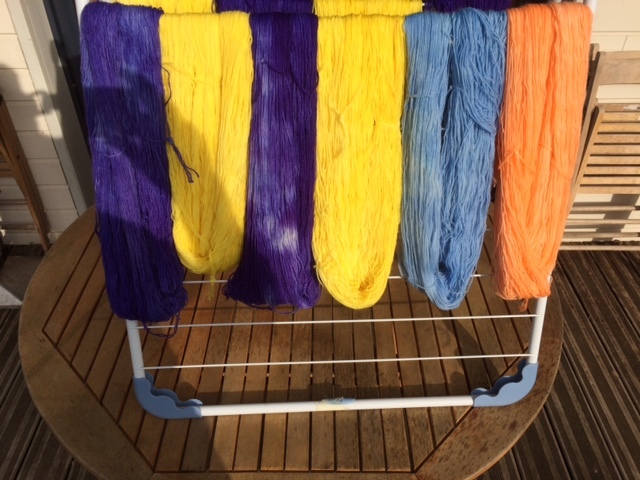 At this time my yarn is being dyed – it takes a long time- and I’ll soon be able to share more about that dye experiment and show you some pictures. 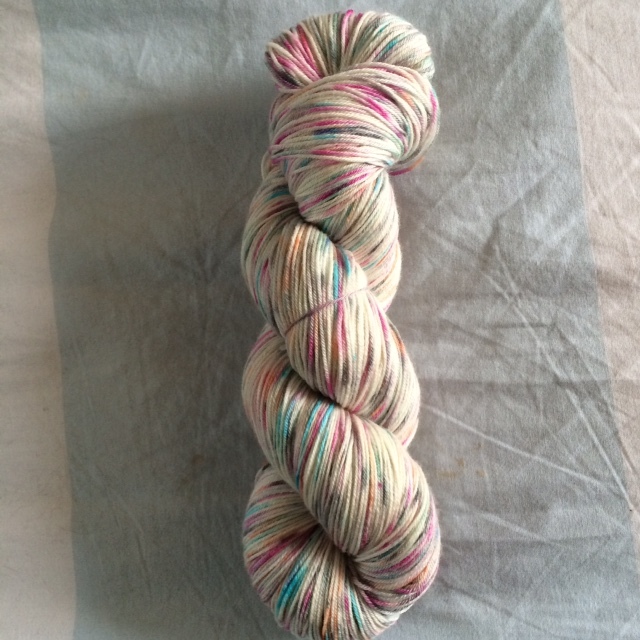 So you have seen my speckled yarn which is super fun to do although quite time consuming so maybe not something that I’ll do a lot of just because of lack of time. 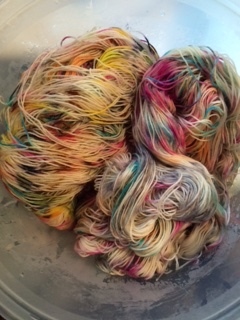 Then yesterday I did some layered dyeing for the first time. This is like kettle dyeing only you dye the yarn with X number of colours, one at a time and in between colours you take out the yarn and rewind it differently so that different parts of the yarn/skein will get different “access” to the dye and thus this will give a very rich and colourful yarn. This can be done with contrasting colours to create a sort of rainbow yarn or by using complementary colors or different colors in the same “family” and that is what I did for my first test. So I dyed using 4 different colours of blue/green colours. They were different depths of colour going from very light to dark. This was super fun to do and a little bit unnerving. After 3 colours I thought the yarn looked gorgeous but I had decided on 4 colours and at that time I was really battling stopping at 3 or go for the 4 as I had planned on. Because each time you do a new colour you never really know what it is going to do and I was worried that the last colour might erase some of the color variations in the lighter colours but hey, this was a test so I went for it! And I’m happy I did because I really love the results. What do you think? 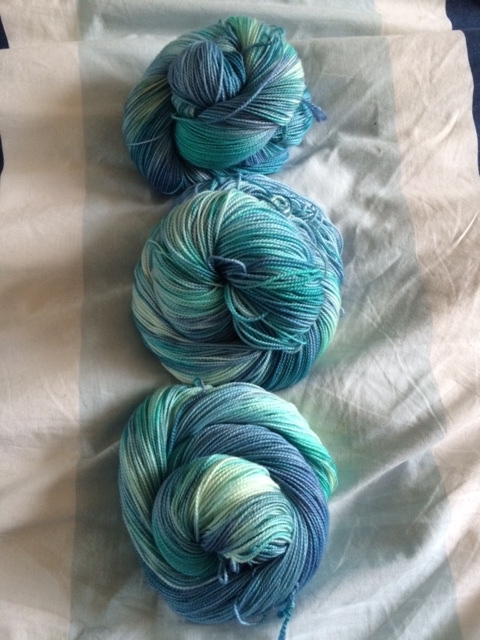 And here you have my 3 skeins of yarn and I absolutely love the outcome. You have different colors that all blend really well. This is not going to give you stripes but will give you more of a varigated effect. I’m keeping one of the skeins for myself to do a test knit to be able to show you how this type of yarn knits up – although each batch will of course be unique a sample swatch or a pair of socks will give you a good general idea. And this morning I’m testing another new technique which is called low immersion dyeing and I’m using a skillet for the first time. 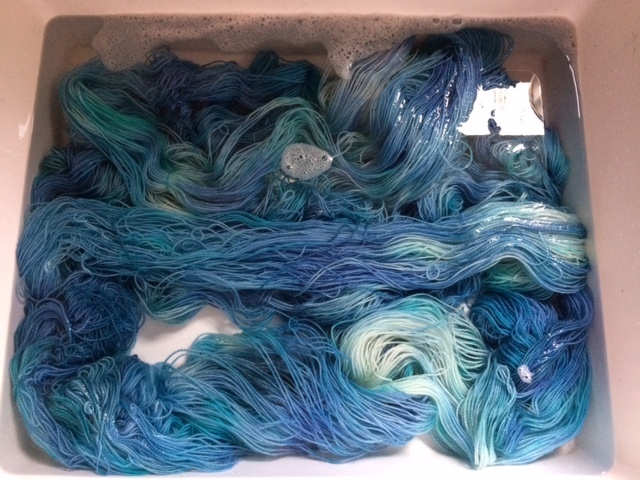 So this is also quite fun, it’s a bit like kettle dyeing only you have much less water and I feel that the yarn soaks up the dye much quicker – at least it did so this morning. 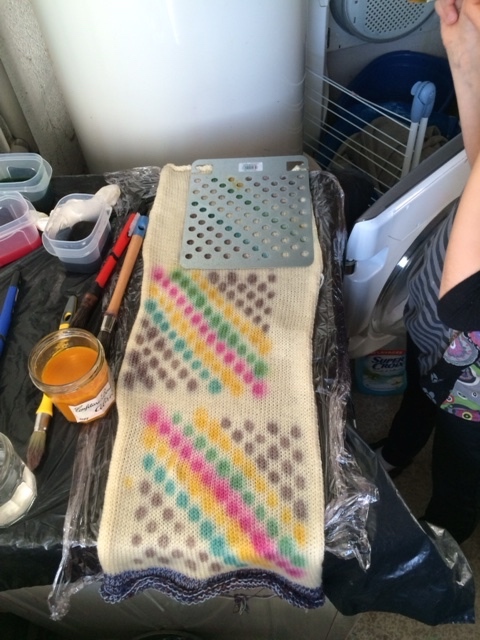 This can produce a semi solid color and I think this can also be fun to use when doing speckled yarn in water (opposed to doing speckled yarn that has been wetted out and laid out on a table for you to dye using a drop counter or syringe. So this morning I did 2 sets of 2 at a time sock skeins. 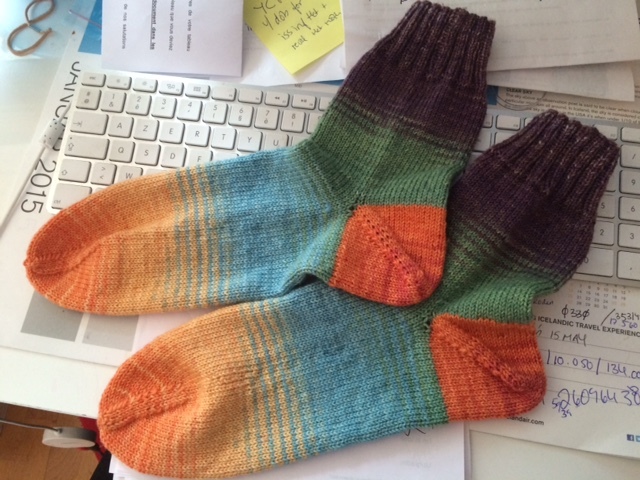 These are 50gr sock yarn skeins and I did them in 2 different colours. One set is brick and the other is purple. 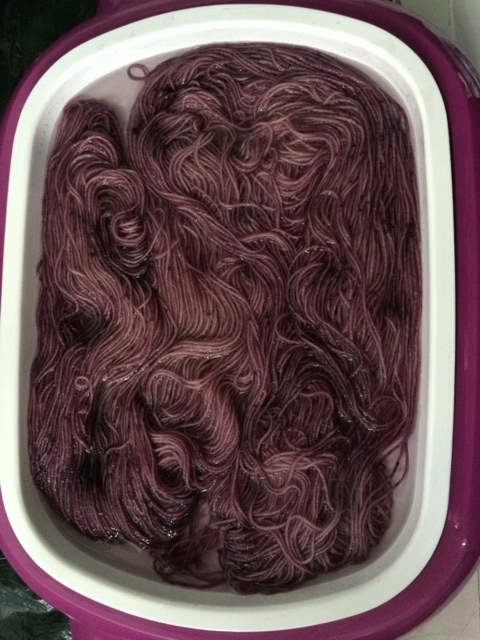 Here are pictures of the yarn in the skillet during dyeing. I’ll soon be able to show you what the finished yarn looks like. 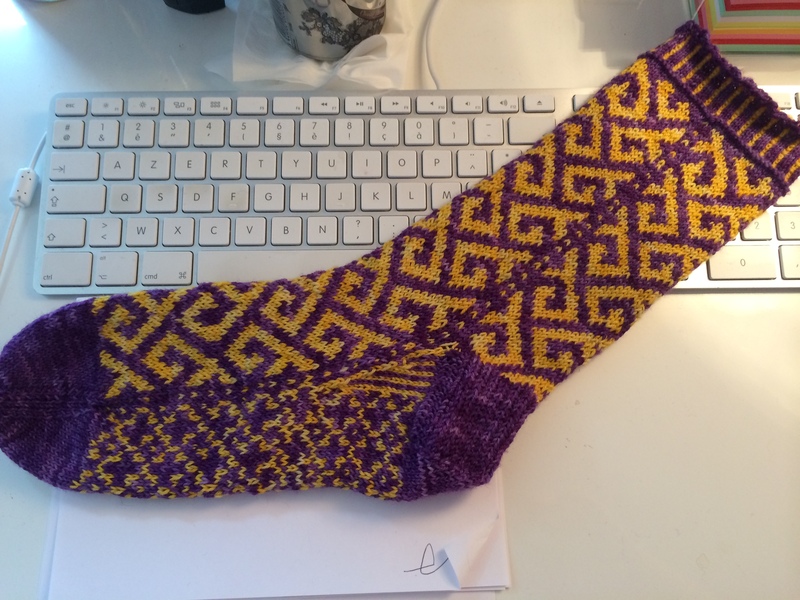 Lately I’ve really changed my mind about sock yarn and I now feel that as much as I love colourful and stripey yarn, that when knitting textured/cabled socks, the pattern really pops out when using a semi solid or solid color. 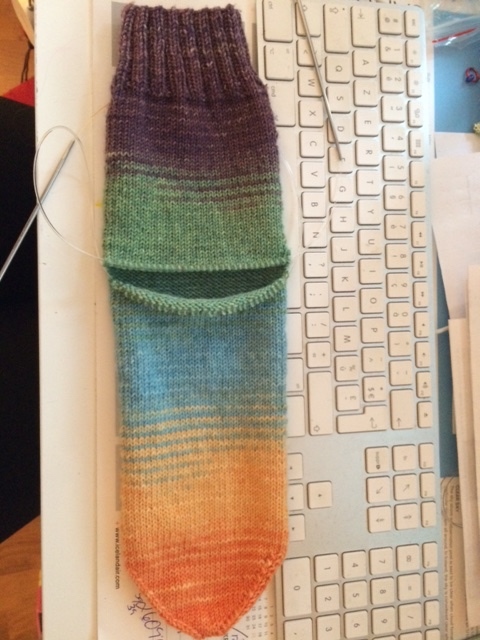 And that the colourful and stripey yarns work better when they are the star of the show alone – meaning when you are knitting plain stockinette socks. How do you feel about that? Well that’s all for today and thank you for stopping by. Tomorrow is going to be really exciting because I’m going to introduce you to an artist and she has a shop and she is offering a special discount to my readers!! Yeah!! So be sure to stop by tomorrow as well as I’m sure you are going to love the surprise guest!